Who Is The True Conservative? 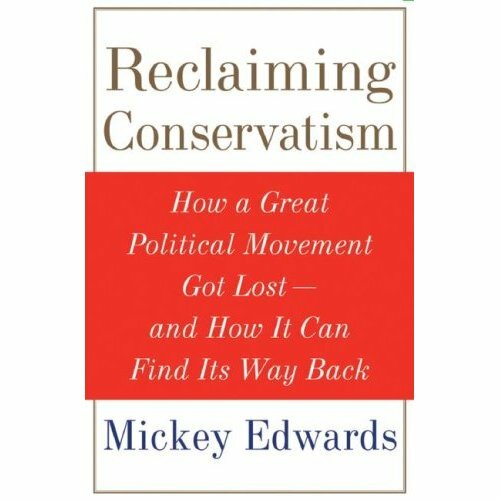 Former Republican Congressman, founding trustee of the Heritage Foundation, and national chairman of the American Conservative Union, Mickey Edwards is the author of Reclaiming Conservatism: How A Great American Political Movement Got Lost- and How It Can Find It Way Back. In the article below Edwards looks critically at the republican candidates for President. Chilling as it is to imagine another 48 states-worth of Edwards’ “robber baron” rants, it is probably a good thing that this year’s presidential campaign still has such a long way to go. This is especially true for Republican primary voters still trying to sort out a field in which each candidate insists he is the truest conservative of them all. The two who have thus far shown the greatest appeal to voters – Governor Mike Huckabee of Arkansas and Senator John McCain of Arizona – embody the two virtues which seem most in demand from this year’s electorate: they represent significant change from the current “conservative” administration and they have exhibited skill at reaching across the partisan divide. What they also have in common is a deep misunderstanding of the proper conservative approach toward the role of religion in public life. McCain has stated publicly that the United States is “a Christian nation.” Huckabee describes himself as a “Christian leader.” Mitt Romney, whose campaign rhetoric makes him seem the least likely of all the Republican candidates to succeed at bipartisanship, shares a similar religious view. In discussing his Mormon faith, Romney avoids making distinctions between Mormonism and other religious traditions and emphasizes instead that he, too, is a Christian, and that being a Christian is a significant credential for anyone seeking public office. True conservatives are, above all, believers in the underlying precept of the Constitution, individual freedom. The nation was very deliberately founded without state religion and with an official prohibition against any religious test for the holding of public office. Indeed, whatever their discomfort with parts of America’s social and cultural practices, most of the Goldwater-era apostles of modern conservatism, believed religion to be a private, not a public and certainly not a political, matter. The founding mission statements of the leading conservative organizations in the United States – the American Conservative Union, Young Americans for Freedom, The Heritage Foundation – are completely silent on the matter. A commitment to “traditional American values” was added to The Heritage Foundation’s list of important priorities only in 1993, after the rise of a powerful religious right, a full twenty years after the organization was founded. Americans are a religious people and, Christopher Hitchens notwithstanding, that is a good thing. Religion has fostered empathy and instilled social responsibility among many believers. But while we are a religious people, we are a secular nation. To equate American leadership with a commitment to any single religion is a dangerous departure from the constitutional principles which underlie not only American law but American conservatism. The current president has violated every basic tenet of American conservatism with his blatant disregard for constitutional limitations on the power of the presidency and his deliberate violation of law. For anyone to claim the conservative mantle (social policies notwithstanding) he will have to make clear that he understands that if elected he would serve as the leader of one of three equal branches of government—and this means without unilateral authority to go to war, suspend habeas corpus, order electronic surveillance of American citizens or suspend U.S. participation in treaties approved by the Senate. So far, Giuliani and the others have a long way to go to show that they understand the concept of divided power. John Edwards tells us there is still a long road ahead of us. Nobody wants to listen to Edwards for that long, but we may have to listen carefully to the Republican field for months more before we learn whether any of them truly understands what conservatives really believe. Ron Paul is the only true conservative. Just check his record. What are you thinking!? Ron Paul has beaten Giuliani in 4 out of 5 of the primaries so far, with 2nd place in Nevada, losing only to Romney. He’s been top of almost every national straw poll, and is the only one, Republican OR Democrat, who stands for *real* change in the right direction. Also he is the only TRUE Conservative standing for the Republicans, believe it or not, before the hijack of the party by the Neo-Conservatives (with strong links to thinktanks like the Counsil on Foreign Relations, and big corporate business, they act more like Democrats than true Conservatives), the Republicans used to be anti-war, anti-large federal government, and were elected to stop wars started by the Dems! In my honest opinion he is the best candidate out of all of them, and should receive fair coverage by all the election media, you weren’t fair, and that puts you into the *biased* side of reporting, which is poor reporting. I mean, the media hardly dwindles on the fact that it looks like Ron Paul is in it for the long haul, with his fundraising feats, and how the other candidates can’t stand up to his *honest and direct* words- ‘Top Tier’ Giuliani doesn’t seem like his platform can take much more, not even coming second in a single primary, Huckabee is BROKE (and has stopped paying wages to staff), McCain wants a 100 years war in Iraq, and the vast majority of Americans are now against the war so he doesn’t have a hope. Who does that really leave…? Romney and Paul, and Romney won’t be able to beat him once the masses hear everything the good Doctor has to say, Romney flip-flops, plays his religion card to it’s limit and I just think Americans feel it’s time for a great change.